Porch column envy was problem back in the ‘60s and ‘70s. Fashion has swung against these monstrosities. Regular readers of this site will recognize that I like the classical look, and this often includes columns. It is not the columns themselves that offend. It is that they are often used where they should not be, are sized inappropriately, or used as an ostentatious display. Andrea Palladio got the ball rolling back in the 16th century, designing houses that looked like temples from antiquity. There are some who still take offense to this innovation, but at least he understood the classical proportions and respected them. The classical revival that followed spawned houses that looked nothing like houses of antiquity, but owed a deep debt to the public buildings of that era. The problem with columns is primarily a problem of the modern era. It isn’t a problem with the modernists. They hate columns, at least anything that presents itself as being something more than a post for supporting a part of the house. The problem comes with the Colonial and Classical Revival houses that were so common in the twentieth century. Some of these did a great job with columns. Unfortunately throwing up a few columns became a shortcut for some builders. Rather than make a serious attempt at reviving a classical look, they just threw up a few columns in front of an ordinary house. 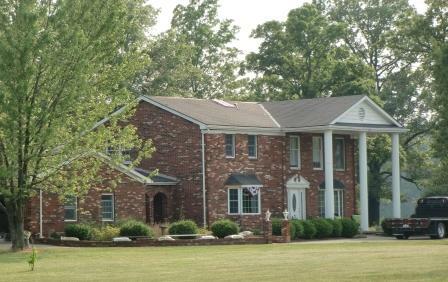 The columns on my neighbor's house fail for several reasons. The column are straight, too narrow and the whole Greek porch thing fails to match the house. The architect ignored any sense of classical symmetry. Not even the part of the house under the porch roof is symmetrical. Luckily it is not visible from my house. A typical problem is the use of columns that are too thin. If it is going to support a classical roof it should bear a classical look. Classical proportions weren’t entirely consistent, but many houses bear columns that are so outside the classical limits that even the untrained eye will recognize that they look odd. The use of columns where they really don't belong goes back a ways. 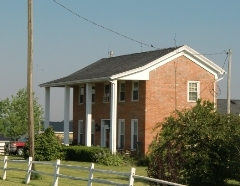 This house is mid-19th century of a common, very basic style. Whether the columns were added later or original they really don't belong, nor do they add much. The porch ceiling is too high and too shallow to actually shade the porch. Still, it was a common addition to many houses of that era. Classical columns also became slightly narrower at the top. Modern columns sometimes ignore this. Straight columns are easier to make, but they don’t look right if they are trying to mimic a classic look. The technical term for the diminution of the columns is “Entasis”. Even architects who have not been classically trained probably understand the concept, but it is obvious that somebody doesn’t care because straight columns keep appearing in classical settings. The spacing and number of columns is another mistake often made. 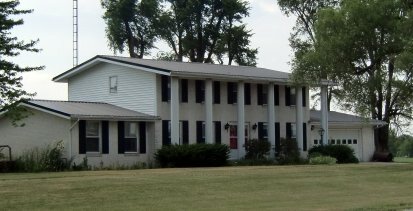 It is not uncommon to see a Greek roof extending out over a porch being supported by only two columns. Or a much wider roof might have more columns, but still considerable fewer than would be found on a classical building. I am not really concerned whether someone is following some rules set out by a long dead architect, the problem is that those rules where there for a reason, and the houses that ignore them often look ridiculous. All of these problems can cause me to wince when I see them, but the biggest concern is the tacking on of columns where their use doesn’t blend with the rest of the house. It is as if they hired an architect to design a house, hired another architect to design a porch and then slapped the two together. This is well-proportioned except for in one regard. The columns are appropriately-sized, but they overwhelm the roof. This porch needs an entablature, a heavy cross-piece to bear the load of the roof. What it has is sufficient from an engineering perspective but it needs something to match the visual weight of the columns. 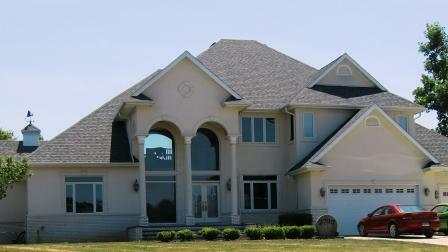 I hesitate to add it here because these columns do make the house better. 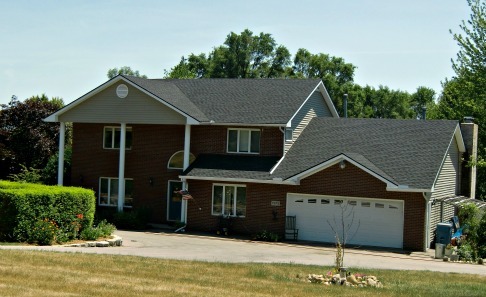 This is more typical of homes in a late twentieth century development. 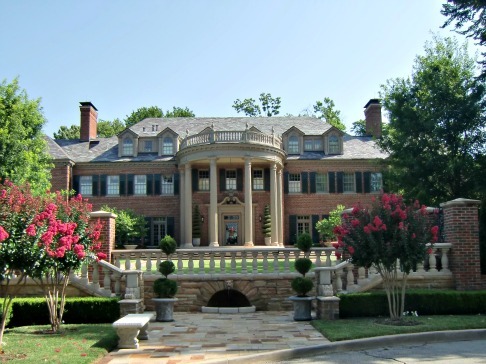 The gable and columns add little to the home. The columns are too narrow for their height and they porch is offset. Had it been centered with wider columns it would have helped. Also, they really need four columns rather than three. We have seen a lot of this in the last few years. Columns frame a very tall, but narrow porch. It is more of a covered entryway than a true porch. This example is even wider than most. It gives a very stylized look, but I expect it will seem very dated in a couple of decades. Perhaps my favorite for ostentatious displays lacking taste. The giant columns support the flimsiest of roofs. What should be a beautiful porch looks like cheap aluminum carport. Furthermore the house is so close to the road, and so elevated that the porch hides the roof of the house. It gives the illusion that the house is flat-topped. The image that comes to my mind is looking up someone's nostrils. It is both fascinating and disgusting at the same time. 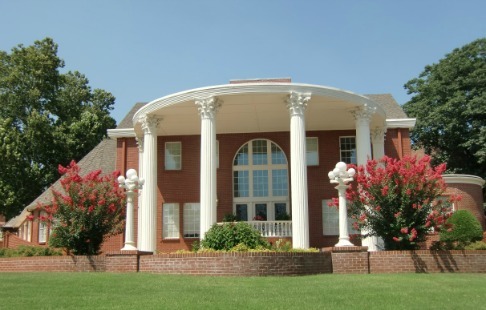 Here is what a rounded portico with the big porch columns should look like. The roof over the porch has the mass worthy of the large columns. A balustrade was added to add to the visual weight.